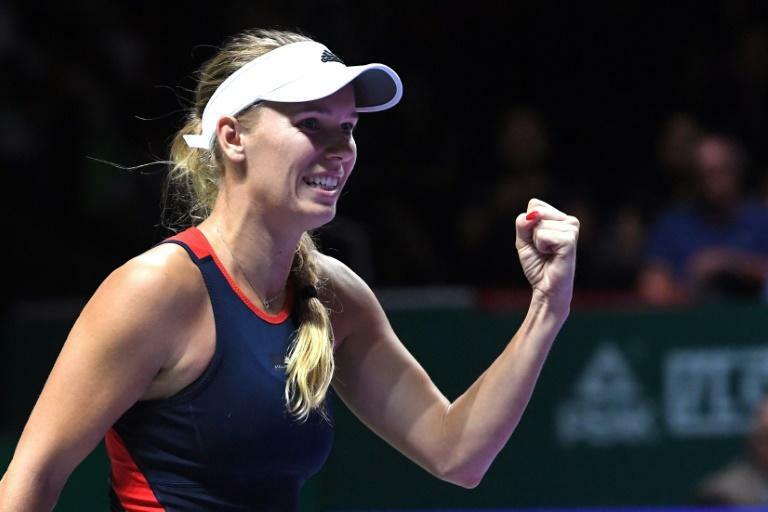 A tenacious Caroline Wozniacki revived her WTA Finals title defence with a third set masterclass against Petra Kvitova on Tuesday, leaving the former Wimbledon champion's Singapore campaign in danger. Rebounding from a disappointing opening defeat against Karolina Pliskova, Wozniacki wore down Kvitova to triumph 7-5, 3-6, 6-2 in two hours and 19 minutes. Kvitova has now lost both her matches but she is still afloat in the White Group after Elina Svitolina defeated Karolina Pliskova in three sets. An undefeated Svitolina is in pole position to qualify for the semis, needing only to clinch one set in her final match against Wozniacki on Thursday. Kvitova mixed trademark power with exquisite touch but was matched by Wozniacki's dogged counterattacks. The Dane recovered from an injury scare, where she needed taping to her left knee early in the second set, and showcased her athleticism in a dominant third set to outlast Kvitova. "It's the patella, which was hurting me," Wozniacki told reporters. "It's something I have had in the past and something I have struggled with for years. (Taping it up) worked for me today." Kvitova said the long match took its toll. "I'm tired right now... more tired than after my first match, definitely," she said. Wozniacki, the Australian Open champion, had the better start and broke in the ninth game –- her first of the tournament after botching 10 break points against Pliskova -– then earned another break in the 12th game to draw first blood. There were three breaks to start the second set before Kvitova held and unleashed a roar as she skipped out to a 3-1 lead. Wozniacki needed a medical timeout and the six-minute break seemingly halted Kvitova’s momentum but the Czech regrouped and levelled it up emphatically with a sliced backhand winner. The match took a turn in the third with Wozniacki breaking immediately and then wearing down a fading Pliskova, who at one point threw her racquet in disgust. In the later match, an aggressive Svitolina traded blows with big-hitting Pliskova to triumph 6-3, 2-6, 6-3 in an hour and 54 minutes. The Ukrainian has been in stellar form in Singapore in a determined effort to make amends for an early exit in her WTA Finals debut last year. "I just tried to stay focused on what I had to do on court and look for my opportunities, move around the ball and strike," Svitolina said. "So just try not to have negative stuff in my head and just go for it." Pliskova lamented her inconsistent serve. "I think my serve was not great today at all, but she's returning pretty well, so she's putting a lot of balls back," she said. It was a grinding affair from the get go highlighted by a marathon third game in the first set, where Svitolina saved six break points. Both players were slugging it out from the baseline but an aggressive Svitolina gained control and broke in the sixth game en route to taking the first set. Pliskova rediscovered her booming serve in the second set and played almost flawlessly, hitting 15 winners and making just three unforced errors. But Svitolina rediscovered her irresistible form from the first set and forced the Czech into errors. She broke three times in the final set to cruise to victory. Even though she lost, Pliskova remains in the hunt to qualify for a second successive WTA Finals semi-final.